Indian youngster Balasubramaniam scored a sensational win against Russian Grandmaster Lugovskoy Maxim in a third round match of the EKA IIFWL Investment Managers 4th Mumbai International GM Chess Tournament 2018. The 15-year-old Chennai-based Balasubramaniam starting with white played aggressively and launched a good attack after the 23-year-old Russian GM Maxim opened with the French defence, a media release said Wednesday. The Indian teenager put his rival under a lot of pressure and than capitalised on an error from the Russian to grab his Queen on the 17thmove. With not much options left, Maxim resigned on the 19thmove to hand the Indian a creditable victory. Meanwhile, India’s 35-year-old GM Chanda Sandipan and 20-year-old IM Visakh N R, the only two players to extend their winning streaks to three successive wins, enjoy the lead at the top with three points each. Sandipan easily defeated compatriot Sammed Jaykumar Shete, while Visakh with the black pieces maintained a cool composure to outwit his Egyptian opponent IM Ameir Moheb in 72 moves. Top-ranked GM Aleksandrov Aleksej (2590) of Belarus dropped half a point as he played out a draw with Indian IM Muthaiah Al (2408) and now has 2.5 points to be placed third. Second-ranked Russian GM Rozum Ivan after sharing a point with Uzbekistan WGM Kurbonboeva Sarvinoz in the second round returned to winning ways as he overcame India’s Saksham Rautelaand is way down the ranking list. IM Muthaiah Al (IND, 2408) 2.5 drew GM Aleksandrov Aleksej (BLR, 2590) 2.5. 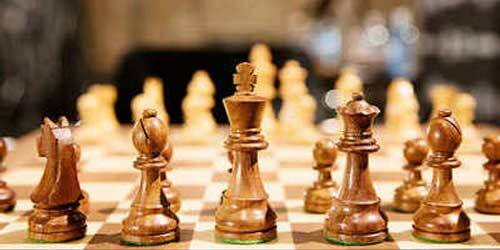 GM Chanda Sandipan (IND, 2555) 3 beat Sammed Jaykumar Shete (IND, 2378) 2. FM Mohammad Fahad Rahman (BAN, 2381) 2.5 drew GM Tran Tuan Minh (VIE, 2524) 2.5. IM Ameir Moheb (EGY, 2327) 2 lost IM Visakh N R (IND, 2491) 3. IM Khusenkhojaev Muhammad (TJK, 2455) 2.5 drew IM Tran Minh Thang (VIE, 2342) 2.5. IM Mohammad Nubairshah Shaikh (IND, 2437) 2.5 drew IM Kathmale Sameer (IND, 2312) 2.5. GM Deepan Chakkravarthy J (IND, 2550) 2.5 beat FM Wagh Suyog (IND, 2240) 2. GM Mosadeghpour Masoud (IRI, 2520) 2 drew FM Anuj Shrivatri (IND, 2357) 2. GM Saptarshi Roy (IND, 2494) 2.5 beat IM Siva Mahadevan (IND, 2333) 1.5. IM Kulkarni Vikramaditya (IND, 2345) 1.5 lost GM Rahman Ziaur (BAN, 2468) 2.5. Balasubramaniam H (IND, 2270) 2.5 beat GM Lugovskoy Maxim (RUS, 2445) 1.5. GM Rozum Ivan (RUS, 2589) 2 beat Saksham Rautela (IND, 2123) 1.5. Banerjee Sushant (IND, 2198) 1 lost GM Movsziszian Karen (ARM, 2505) 2.